As many of you will know I am a huge fan of punk band Against Me! 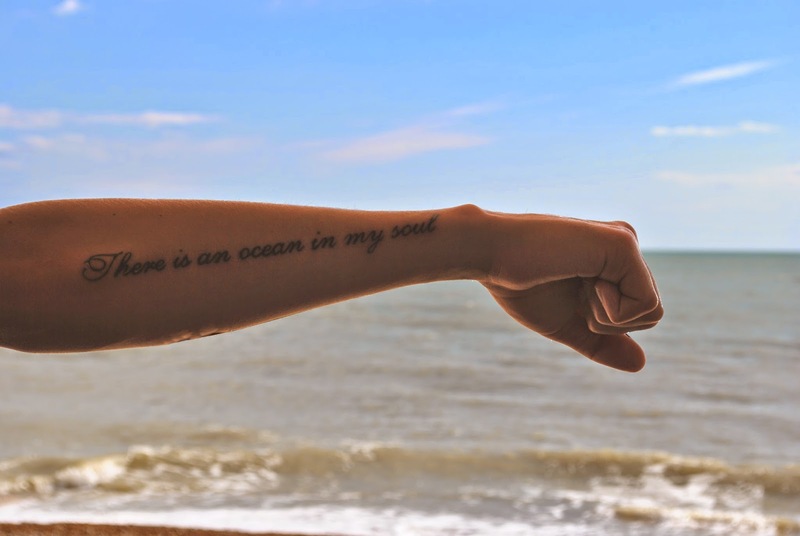 and this is a line from their song 'The Ocean', which is on their fourth studio album 'New Wave' (2007). It isn't so much that I particularly love that song. Don't get me wrong, it's a great song and I dig it, but I just love that line. I love the imagery that it conjurers up. Laura Jane Grace is a fantastic song writer and I can't wait to see Against Me! live, for the first time, in November! I really hope they play 'The Ocean'. Definitely my favorite Against Me! track. Those last 2 minutes are intense. It's a damn beautiful song, man. Congratulations on losing your tattoo virginity!! I lost mine two years ago to a tiny little pentacle on my ankle, and have since gotten two more, big ones too! I never thought I'd get even ONE. So look out, because you'll get addicted. I'm just saying. Of course, I married a sailor with 16 of them, so maybe mine were inevitable. Very nice. Do you plan on getting any more? I have one and have been tempted to get a second but I can't decide where or what. Yes! I pretty much have my next three already planned out. They were planned out before I even got this one. Haha. It's gorgeous- what a lovely script! I lost mine two years ago- it's a cherry blossom flower (long, sad story) on my left wrist. I need to get more work done on it (this year!) and I'm probably getting my second one done too. Sure is. What's the second one you are going to get? Well it took ya long eniough! Damn, dude. Looks great though, excellent placement choice. Don't tattoos on bone feel great? All 7 of mine did. XD Actually serious, apparently the fleshy parts are worse, but I'm a bit of a masochist and will probably grin through those as well when I get there. Baha. Have you had any more recently? Now that you've got a fancy pants new job you should treat yourself. So... you go get more! That's an awesome tattoo! I love when people put more thought into their tattoos than just a skull or a butterfly or a cross - something that holds more meaning and can be unique to them. That's why I designed both my tattoos by myself. Of course, the second one was just the font and placement that I designed, but still. Thanks, but... my girlfriend has butterfly tattoos. I like butterflies. I was thinking about getting a butterfly. :( Don't they signify, like...freedom? "Beeeeeeeeeen, can you do this?"